Dal 1814 a Solingen, Germania, Wusthof produce eccezionali coltelli da cucina apprezzati dai migliori chef internazionali. L´assortimento WÜSTHOF conta oltre 350 coltelli forgiati, così come taglieri, ceppi per coltelli, utensili da cucina e forbici con il famoso logo a tridente - un simbolo di forma, funzione e qualità senza compromessi. I coltelli WÜSTHOF sono degli strumenti apprezzati dai più rinomati cuochi al mondo e amanti dell´arte culinaria. La Coltelleria Collini di Busto Arsizio è rivenditore ufficiale per l'Italia del marchio e dei prodotti Wusthof. The magnetic bars have extra strong magnets that guarantee a secure anchoring of the steel knife. The magnetic bar needs little space. The knives are always well ordered and ready to use. We recommend positioning the knives with the tip of the blade at the top. - chef's knife 4582/18 - length blade 18 cm - length tot. 30.5 cm - weight 172 gr. - thin thread knife 4518/20 - length blade 20 cm - length tot. 31 cm - weight 78 gr. - paring knife 4066/10 - length blade 10 cm - length tot. 20 cm - weight 64 gr. The handles: made of synthetic material and joined with a triple riveting ensure a perfect seal, excellent stability and guarantee dishwashing. Blades: they are obtained using the best steels and combining the most qualified elements (chrome 15% - 0,5% carbon - molybdenum - vanadium). The realization of a WUSTHOF forged knife foresees the passage of about 40 processing cycles. - Take care that knives placed in the dishwasher bite other objects; it could damage the blades. - Knives guaranteed for dishwashers that are not immediately washed in the machine should be rinsed under the water tap to remove the remains of highly corrosive foods (fats, vinegar, fruit juices). - Make sure that the knives no longer cut perfectly, that they are grinded or sharpened by professionals in the sector. The WUSTHOF knives sold by us are carefully checked and, if necessary, further sharpened in our in-house laboratory, in order to guarantee you the certainty of an excellent purchase. All Wusthof products sold by us are screen printed indelibly with the Collini Cutlery logo (as shown in the picture). This marking guarantees the purchaser the certainty of quality, traceability, warranty over the years and a future privileged assistance on the product purchased at the Coltelleria Collini. - chef's knife 4596/20 - length blade 20 cm - length tot. 34 cm - weight 264 gr. - chef's knife 4596/20 - length blade 20 cm - length tot. 33 cm - weight 269 gr. An indispensable tool for maintenance of knife cutting edge. Length of abrasive element: 20 cm. - Be careful that the knives put into the dishwasher an urtin other objects; They could damage the blades. - Dishwasher safe knives that are not immediately washed in the machine should be rinsed under the tap to remove the remains of highly corrosive foods (fat, vinegar, fruit juice). - Make sure if the knives no longer cut to perfection, make them straighten or sharpen by professionals in the industry. Length of abrasive element: 31 cm. Diamond grain: to be used with care as being more "aggressive" than a regular steel rod. Ideal for restoring a particularly dull or damaged wire, we recommend a subsequent passage with a finer grain base. Length of abrasive element: 26 cm. Length of abrasive element: 22,7 cm. Length of abrasive element: 22,5 cm. SUPER FINE: ideal for frequent use (even whenever it is cut) on wires not particularly worn. - Handles: PVC with a triple rivetingensuring a perfect fit, excellent stability and ensure the dishwasher. The blades are obtained using the best steel and combining the elements most qualified (15% chromium - 0.5% of carbon - molybdenum - vanadium). BBQ Set - 9883 Highlights: BBQ set consisting of high-quality metal tongs, fork, spatula and brush - to turn every barbecue into a real experience. The tongs are ideal for positioning, turning and serving meat, fish and firm vegetables. They have easily adjustable spacing and ensure safe and easy handling when barbecuing. The fork can be used to place the food skilfully and safely on the barbecue grill. The long spiked tines provide a firm grip even for larger pieces of meat, such as chicken legs. The rounded spatula comes into its own for safely and easily turning burgers, steaks etc. And when it comes to cleaning up and putting things away, it´s time to use the barbecue brush - this will get the grill spotlessly clean quickly and easily. The short bristles will remove even the most stubborn dirt from every corner of the grill. The new 4-piece barbecue set - all in matt-finish, high-quality stainless steel - has a clever, functional and impressively modern design. The long, stable handles on the tongs, fork, spatula, and brush provide a safe hold as well as very good protection from the scorching heat when barbecuing. Made entirely from 18/8 stainless steel, the spatula and other tools are easy to clean and are also suitable for dishwashers. The tongs, fork and spatula can be hanged conveniently on the barbecue using the rounded hook on the shaft so that they are always ready to hand. Once your work is done, the four implements can be safely and cleanly stored away in their black nylon bag. In order to save space, the bag can also be rolled up ready for the next time you have a barbecue. An intelligent way to expose and store your knives and kitchen utensils! This magnetic bar entirely made of a single piece of brushed aluminum is equipped with two extra-strong magnets that guarantee maximum sealing and safe use. Little space is needed and all tools are well-ordered and ready to use. Easy to assemble, comes with two screws and two dowels to secure it securely in the wall or between the tiles. Water synthetic stone meant to rectify and smooth stones for sharpening worn or damaged. The hollow edge creates pockets of air which prevent extra thin or soft slices from sticking to the blade. Knife Block Gourmet serie, made of beech wood. Measurements of block only 28 x 17 x 9 cm. 4 table knives ideal for cost, steaks and meat in general. The Handles: made of synthetic material and joined with a triple riveting ensuring a perfect fit, excellent stability and guarantee the dishwasher. Le Lame: I am obtained using the best steel and combining the most qualified elements (chromium 15% - 0.5% carbon - molybdenum - vanadium). The realization of a forged knife Wusthof provides for the passage of about 40 working cycles. - Please make sure to put the knives in the dishwasher a bumping other objects; You can damage the blades. - The knives guaranteed for dishwashers that are not immediately washed in the machine should be rinsed under the tap to remove the remains of the highly corrosive foods (fats, vinegar, fruit juices). - Make sure if the knives do not cut more perfectly, to have them corrected or sharpened by professionals in the field. The Wusthof knives sold by us, are carefully checked and if necessary to further sharp in our internal laboratory, in order to guarantee you the certainty of a good buy. 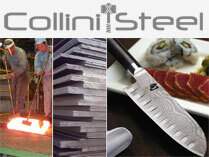 Wusthof all products we sell are screen printed indelibly with the logo of Collini Cutlery (see picture). This marking warrants to be sure about the quality, traceability, assurance over the years and a future prime care product purchased at the Collini Cutlery. Three knives rounder, ideal for cutting vegetables, fruits and meat. - Chef's knife 4596/20 - length. blade 20 cm - length. tot. 34 cm - Weight 264 gr. - Ham / Roast knife 4506/20 - length. blade 20 cm - length. tot. 33 cm - Weight 174 gr. - Paring 4086/9 - length. blade 9 cm - length. tot. 19.5 cm - Weight: 72 gr. Duo Oriental knives, a Chinese and a Santoku ideal for cutting vegetables and fruits. - Chinese knife 4691/18 - length. blade 18 cm - length. tot. 30.5 cm - Weight 242 gr. - Santoku knife 4188/17 - length. blade 17 cm - length. tot. 29 cm - Weight 122 gr. Empty suitcase for chefs. Made of durable ripstop fabric with rigid reinforcements. Inside there are 7 spaces for medium / large knife (with blade length of up to about 32 cm, 46 cm total) and 3 for smaller knives or accessories. The bag has a shoulder strap. Empty suitcase from chef. Made of durable ripstop fabric with rigid reinforcements. Inside there are 9 spaces for medium / large knife (with a blade length of up to about 32 cm, 46 cm total) and 7 for smaller knives or accessories. The bag has a shoulder strap and padlock. The extra-sharp blade is not only a must for cutting your favorite steak but also for all kinds of meat dishes. Forged from one piece of specially tempered high carbon steel to ensure outstanding strength. Handle made of Grenadill wood (African Blackwood) - one of the hardest types of wood in the world. All farming is limited to a small quantity and government- controlled. Special alloyed steel. Extraordinary sharpness which is easy to maintain. Perfectly balanced for effortless cutting. Seamless; hygienic fit of the handle. Stainless. Triple-riveted handle shells, full tang handle. Specially designed bolster. Not dishwasher safe, wash by hand only. Exceptionally sharp. Blade length 12 cm (4 ½"). 4 pc. set. Not dishwasher safe, wash by hand only. Wusthof - Traveler Set 7 pieces - Kitchen Knives The set for travelers - the ideal travel companion for any avid cook: The survival kit that makes you happy chefs even when on holiday. WÜSTHOF offers the ideal solution for all travelers: three knives series CLASSIC, kept in a clean and safe in a black nylon bag washable. This essential set of kitchen is complete with a kitchen scissors, a knife sharpener and a corkscrew. - Art. 4066-9 Paring knife: The most versatile of all the peeling knives to slice the shallots, onions and herbs as well as useful for cleaning and cutting vegetables. - Art. 4110-14 Knife Sausage: The decision to cut sandwiches and bagels, surely a favorite for hard salami and even the more mature tomato. - Art. 4582/16 Chef Knife: ideal for chopping, slicing and chopping vegetables, meat and fish and is the most essential of all knives used in the kitchen. Perfectly balanced, an extension of your hand. Precision forged from one piece of steel with threaded tang boss. Ergonomic design developed in collaboration with professional chefs. - Art. 5558 Scissors Kitchen: you can be used to cut foods such as herbs, cut flowers, paper and twine. - Sharpening steel sharpener: This sharpener is designed to make the blade sharpening a child's play, even for those with no experience in the field. - Corkscrew: with a non-slip coating is provided with a long lever for the opening effort of bottles of wine. - Knife bag: made of nylon, has dimensions of 32 x 15 cm closed. We recommend the use of guards to protect the blades. Blades: are obtained using the best steel and combining the most qualified elements (chromium 15% - 0.5% carbon - molybdenum - vanadium). The realization of a forged knife WUSTHOF involves the passage of about 40 cycles. Knife block made of high-quality ash, black color. Block measures only 26 x 21 x 9 cm. Knife block made of high-quality, black color. Block measures only 26 x 21 x 9 cm. The stones sharpener WUSTHOF have a combination of quality of different grains. Are made using a special cooking process that lasts 14 days. In this way you get a robustness that lasts in time. The innovative and practical tray firmly holds the stone and provides excellent stability and a high level of safety when sharpening. The waste is collected in the pan sharpening, so the workplace remains clean. The Blades: are obtained using the best steel and combining the most qualified elements ( chromium 15% - 0.5% carbon - molybdenum - vanadium ) . - Please make sure to put the knives in a dishwasher from hitting other objects; it may damage the blades. Wusthof All products we sell are screen printed indelibly with the logo of Collini Cutlery ( see picture) . The CE marking means the buyer to be sure about the quality , traceability , warranty assistance over the years and a future prime product purchased at the Collini Cutlery . Case Chef's empty resistant fabric. It 's suitable to contain twelve o'clock knives with a blade length up to 32 cm with gadgets. Specific knife for cutting the bread. The new double serrated edge allows you to cut more easily ( and more accurately ) than a traditional bread knife . The cut is also more durable in contact with the crust of the bread is usually very hard (on which a knife with a smooth edge almost immediately lose its ability to cut) . - Blade of 23 cm (total length 35 cm), weight 180 gr. Set di 4 forchette produzione Wusthof per aragosta e granchio. Semplice confezione di 4 forchettine per aragoste, con linea elegante, comode da utilizzare, ma interessanti anche da regalare. Completamente in acciaio inox.Questa forchetta è un essenziale per l'amante dei crostacei. - Chef knife 4596/20 - length . the blade 20 cm - length . tot . 34 cm - Weight: 264 gr. - Paring 4086/9 - length . blade 9 cm - length . tot . 19.5 cm - Weight: 72 gr. Wusthof All products we sell are screen printed indelibly with the logo of Coltelleria Collini (see picture) . The marking means the buyer to be sure of the quality, traceability , warranty assistance over the years and a future prime product purchased at the Coltelleria Collini . - Chef knife 4582/20 - length . the blade 20 cm - length . tot . 33 cm - Weight: 260 gr . - Bread knife 4149/20 - length . the blade 20 cm - length . tot . 31.5 cm - Weight: 128 gr. - Paring 4066/9 - length . blade 9 cm - length . tot . 19 cm - Weight: 60 gr. Wusthof All products we sell are screen printed indelibly with the logo of Coltelleria Collini (see picture). The CE marking means the buyer to be sure of the quality, traceability , warranty assistance over the years and a future prime product purchased at the Coltelleria Collini. - Precision forged from a single piece of steel with collar and inner blade and handle constructed in a single piece. - Ergonomic handle design developed in consultation with professional chefs. - Collar / finger guard for improved safety and security. - Pure perfection of function and design. The all-steel knife for gourmets. - Forged from a single piece of steel and fitted with a stainless steel handle. The Blades are obtained using the best steel and combining the most qualified elements (chromium 15% - 0.5% carbon - molybdenum - vanadium). The realization of a knife forged WUSTHOF involves the passage of about 40 cycles. Proper care will increase the life of the knife, making it easier and safer to work and reduces the consumption of the wire. Knife suitable for cooked and raw meat. Knife do everything in the kitchen, from the cutting of vegetables to the cutting of meat, with the possibility of splitting small ossicles using the lower part of the blade, where the wire is more robust. The holes on the blade are intended not to adhere to the food to the blade during cutting. Precision forged from a single piece of steel with collar and inner blade and handle constructed in a single piece. Ergonomic handle design developed in consultation with professional chefs. Collar / finger guard for improved safety and security. Forged from a single piece of stainless steel and equipped with a stainless steel handle. Coltello decoratore adatto per intagliare le bucce degli agrumi ed in particolar modo dei limoni - Lama in acciaio inox di 3.7 cm. - cinque intagli a U di 2 mm. di larghezza - manicatura termoplastica - lunghezza totale 14.5 cm. - peso di 26 g.
Grazie al nostro laboratorio interno di affilatura, garantiamo un filo taglientissimo a tutti i coltelli. Caratterizzati da un design innovativo, offrono una nuova esperienza tattile ed un'incredibile grado di affilatura e di tenuta del filo stesso grazie alla precisa forgiatura ottenuta da barre di acciaio inox al vanadio ed ai test e controlli al laser sull'affilatura. Sono inoltre facili da riaffilare e molto robusti grazie alle impugnature in legno African Blackwood scelto per la bassa porosit, l'estrema densit e per l'alto contenuto di resina. Specific knife for cutting bread. Thanks to the presence of the serrations on the blade edge, the cut remains more durable even in contact with the bread crust usually very hard (on which a knife normal lose the thread almost immediately). Handles: plastic and combined with a riveting triple ensuring a perfect fit, excellent stability and ensure the dishwasher. - Please make sure to put the knives in the dishwasher to hit other objects to avoid damaging the blades. - The knives guaranteed for dishwashers that are not immediately washed in the machine should be rinsed under running water to remove the remains of the highly corrosive foods (fats, vinegar, fruit juices). - I'm not sure if the knives were most perfectly cut, corrections or refine by industry professionals. The Wusthof knives sold by us, are personally inspected and further sharpened in order to ensure the certainty of a good buy. Knife designed for cutting salmon, thanks all'olivatura on the blade is precise and easy to control. Appropriate knife for fillet fish extremely flexible, thin and sharp. Soddisfatto del prodotto. Buon rapporto qualità/prezzo.